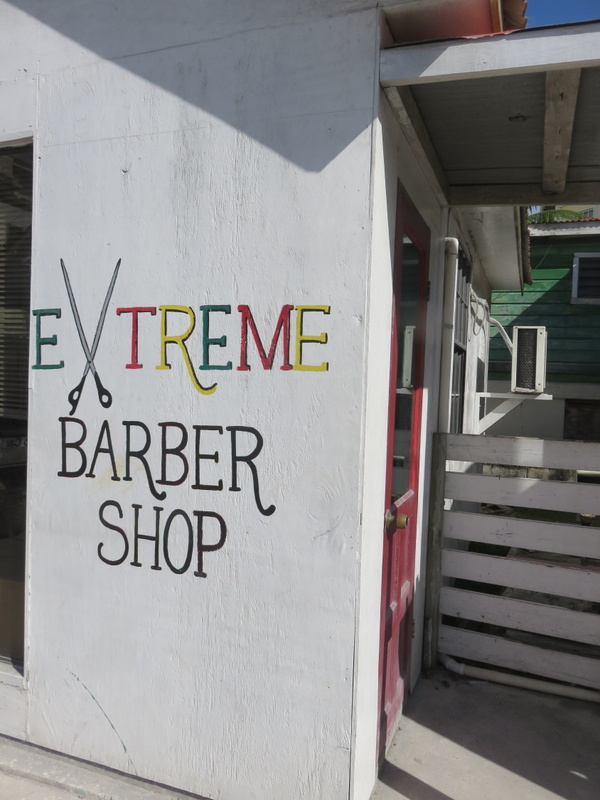 For a town of about 13,000 permanent residents, we have an amazing amount of barbershops. 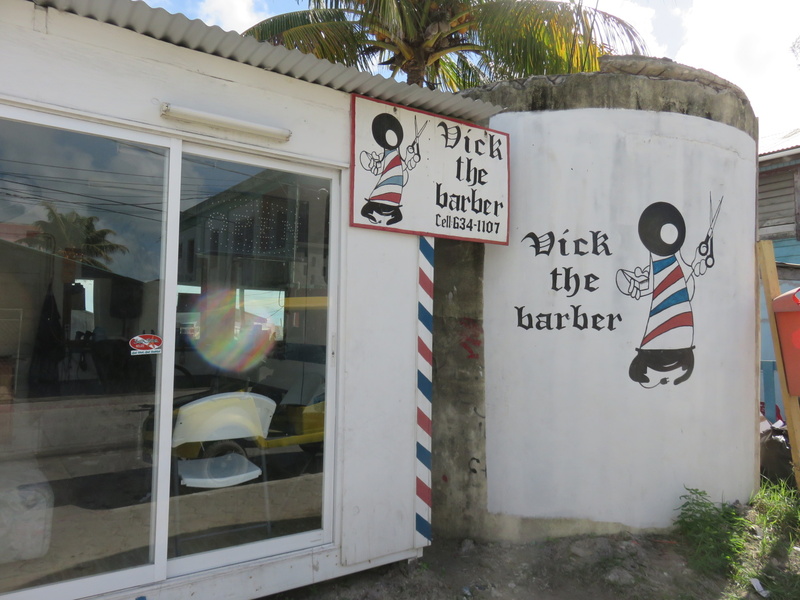 Vacationing visitors do not get their hairs cut – but guys on the island like to keep their ‘dos high and tight and their shaves close and clean. One barber told me some guys like to get a touch up every 4-5 days! So I thought I’d take a walk to town and see how many shops I could photograph. I found that, by number, golf cart rental shops may be outnumbering them. 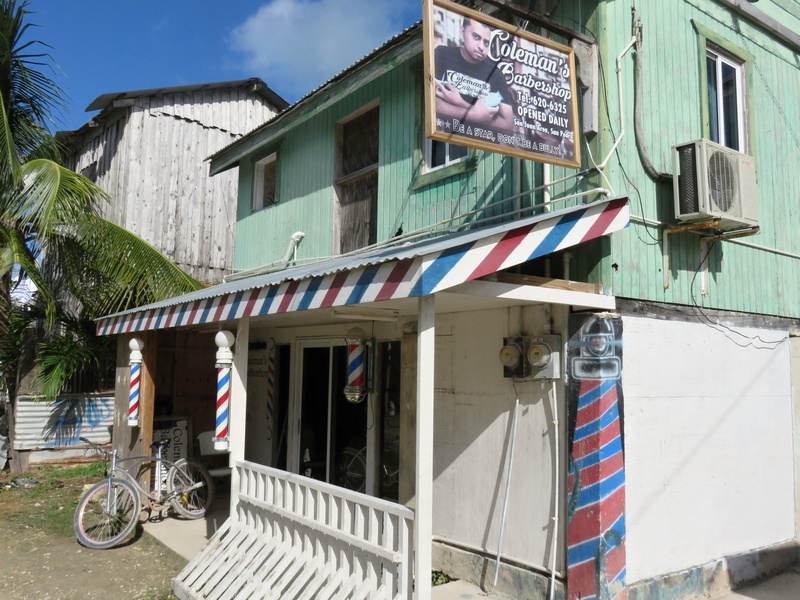 But it was a beautiful day and I was focused on the barbers of San Pedro. And it was easy to start with the one right across the street from me. 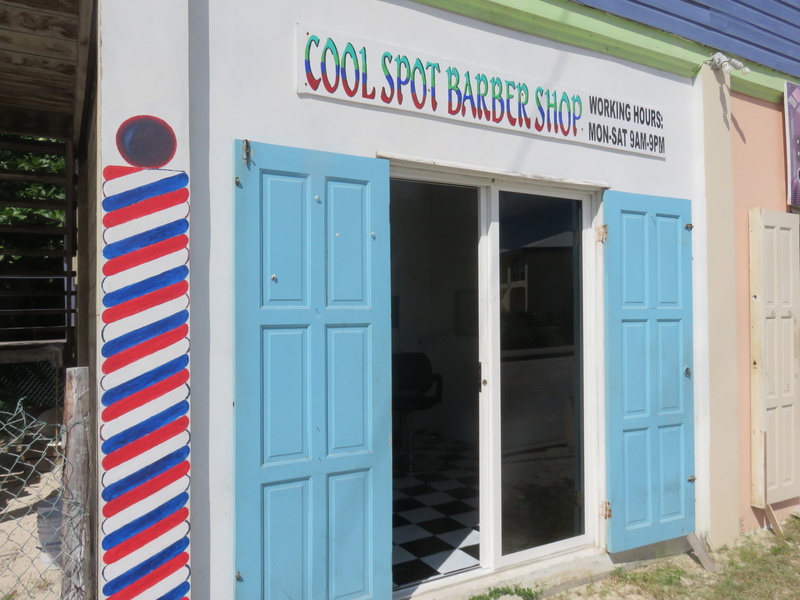 Technically not a barbershop but they have one of the grooviest radio theme songs you will ever hear. I got a secret tip about this one. Tucked down a small side street by AJ’s Bar. 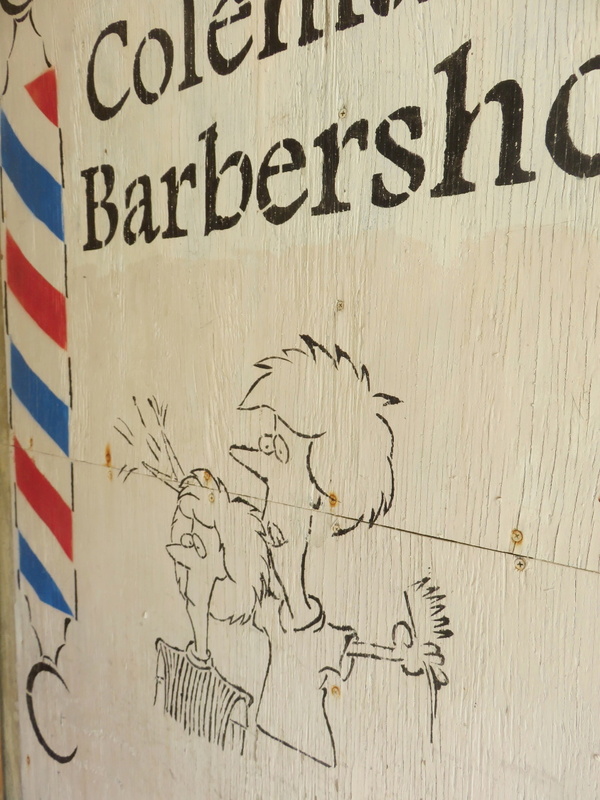 Apparently this is one popular with the “old guys” – this barber is good with scissors. And then I hit town…$5bzd for kids, $10bzd for adults. 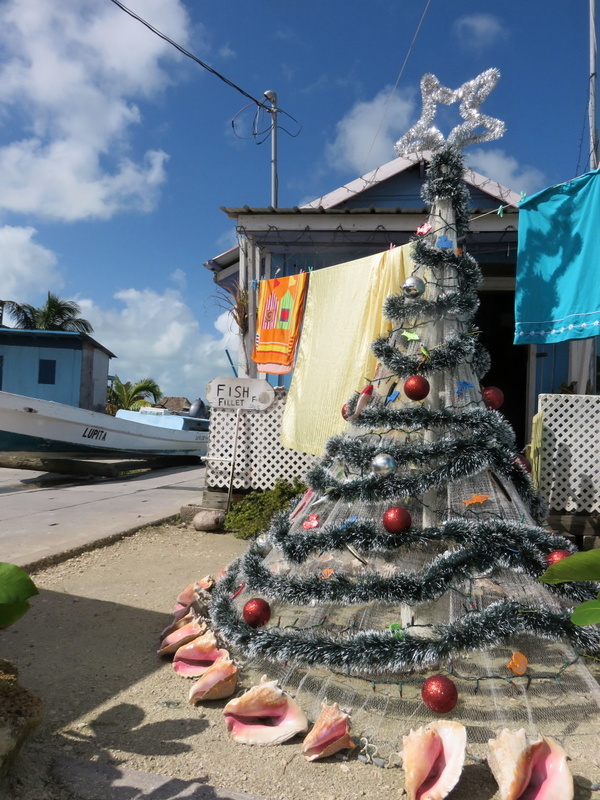 And a pretty Christmas tree on the lagoon side. 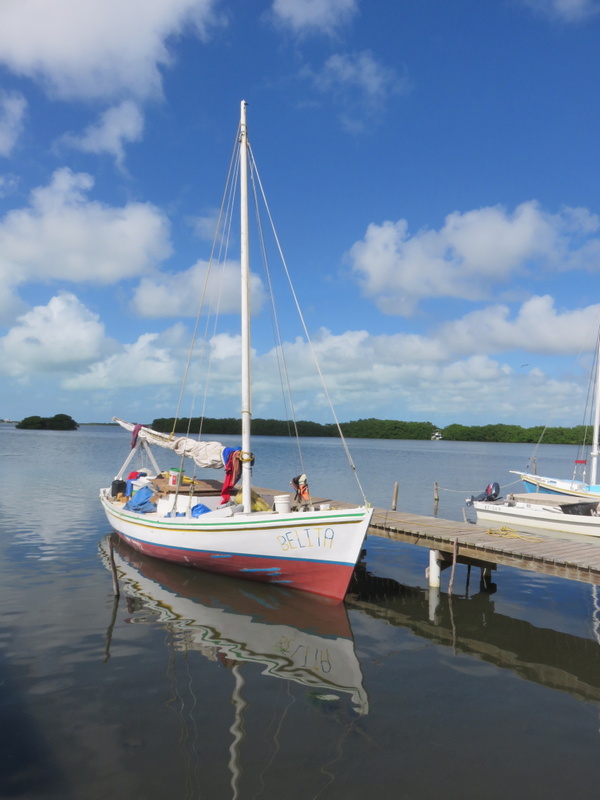 Back in that area, I found this pretty boat. And then to Back Street. 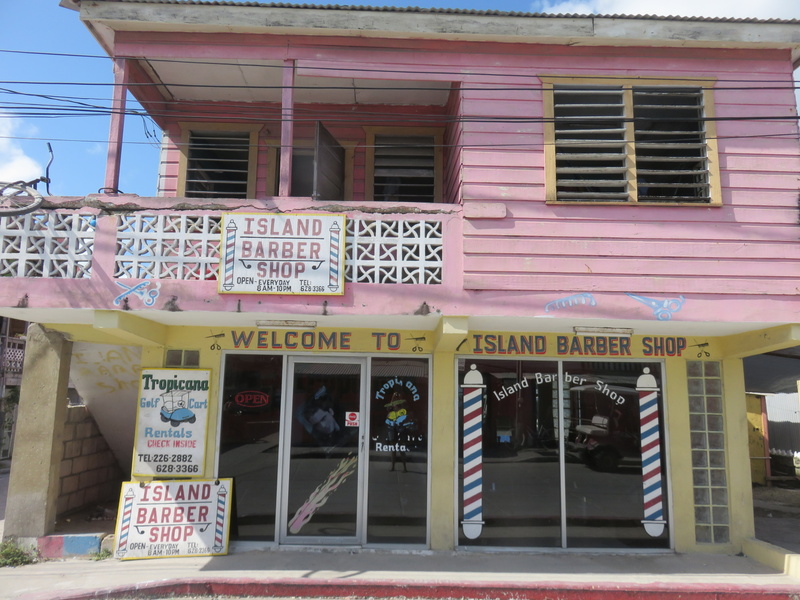 And Island Barbershop…the biggest one I saw. On Middle Street…I’ve seen many men getting their hair cut here…plus, salon/used book store? Genius. Aquarius Salon. 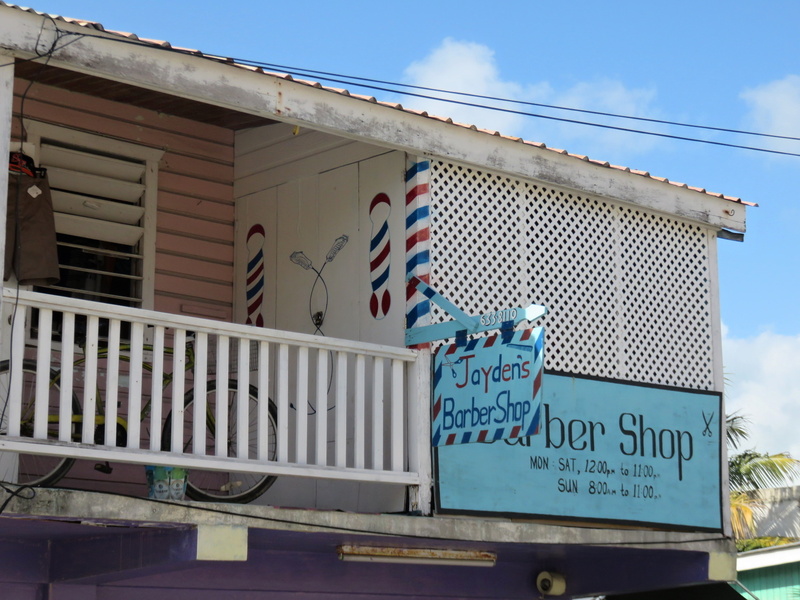 And the Ballers Barbershop. 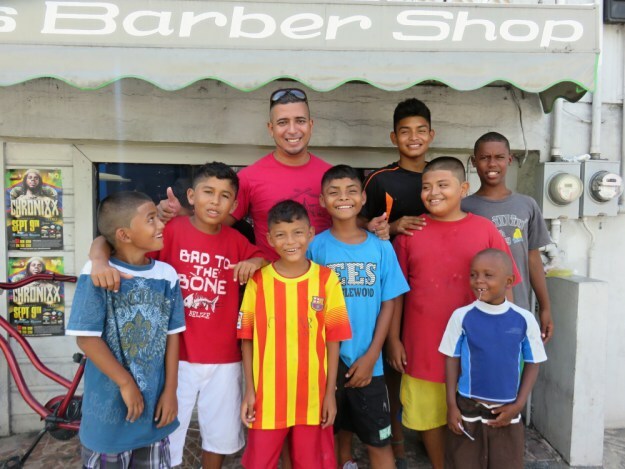 Close to my heart for giving 50 kids pre-school haircuts on Saturday morning. And then on Front Street, a blow dry bar! 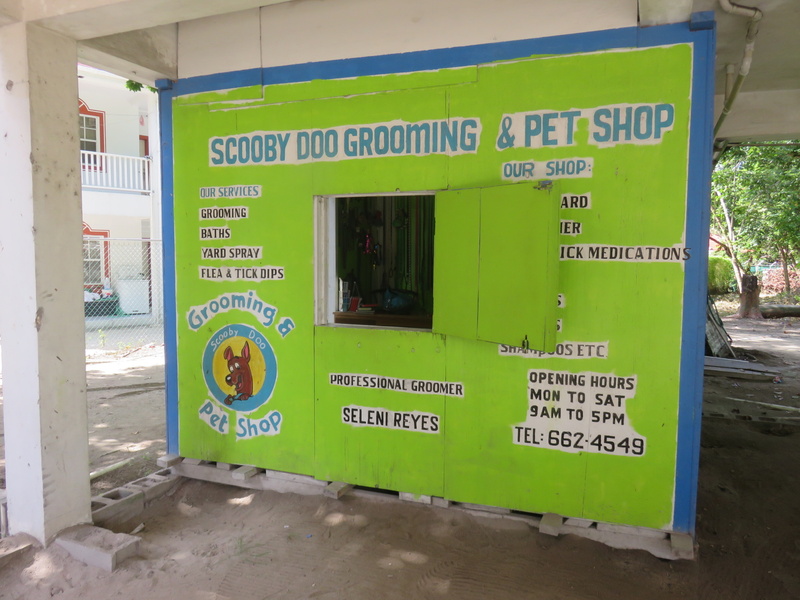 New and exciting in San Pedro. I am just waiting for the humidity to dip below 80% to try it out. I hear great things from the ladies! A quick lunch at Estel’s…this is lots of walking around! And the day was absolutely gorgeous. Okay…back to the clippers and the Barbisol cannisters. 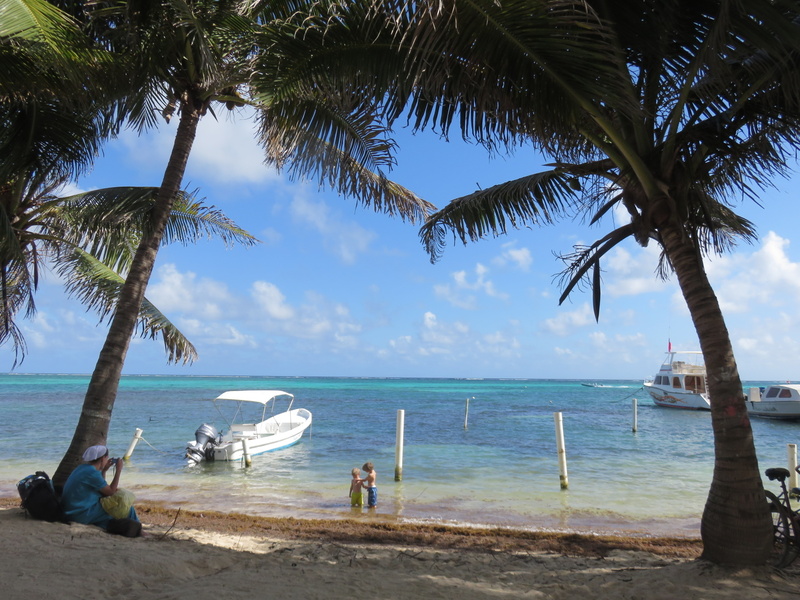 I hit the Boca Del Rio area just north of town. 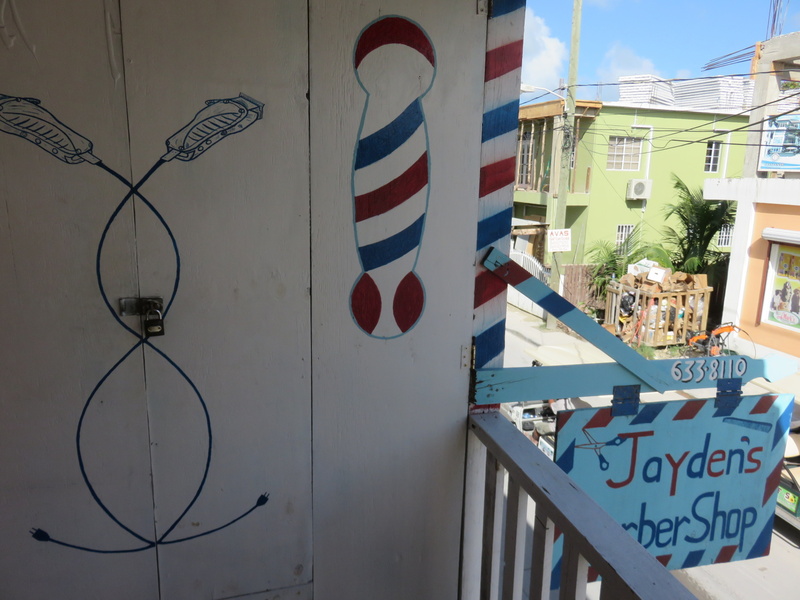 And on a second floor, Jayden’s Barbershop. I had to climb the stairs for the paintings. This shop has closed. But I always like this post. Funny to me. 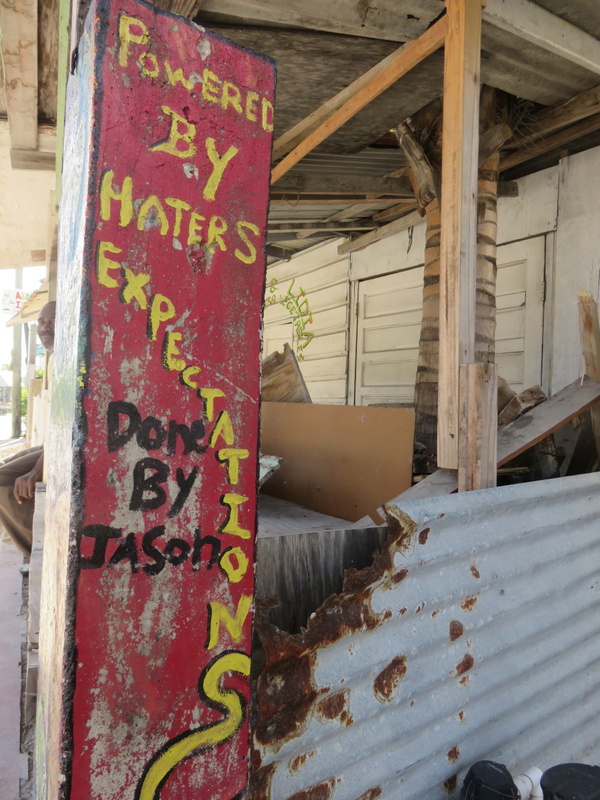 And then a few streets toward the lagoon, I found Coleman’s – motto: Be a star, not a bully. Good stuff. I bet I missed a BUNCH. 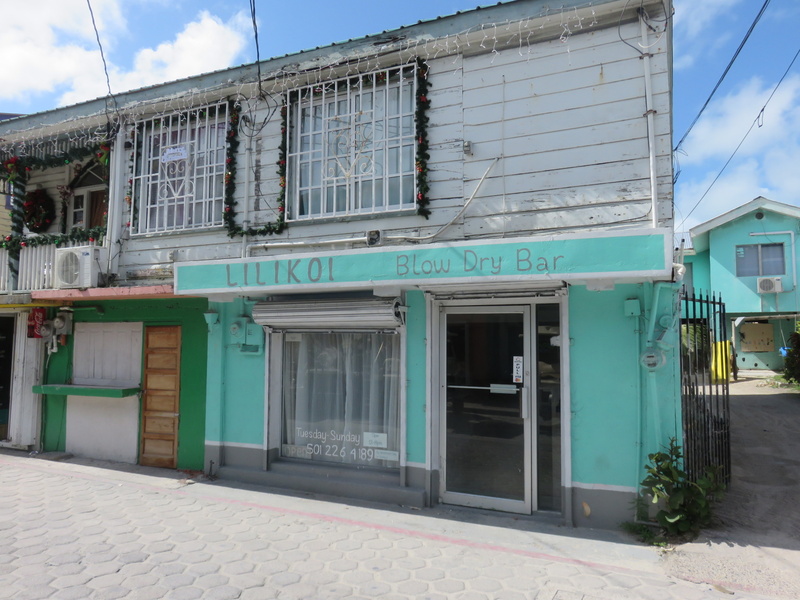 I didn’t walk through all the neighborhoods of San Pedro. If you have a tip for me…please let me know. Love some of the artwork on these places. but never thought of counting them. dayimn there are a lot. 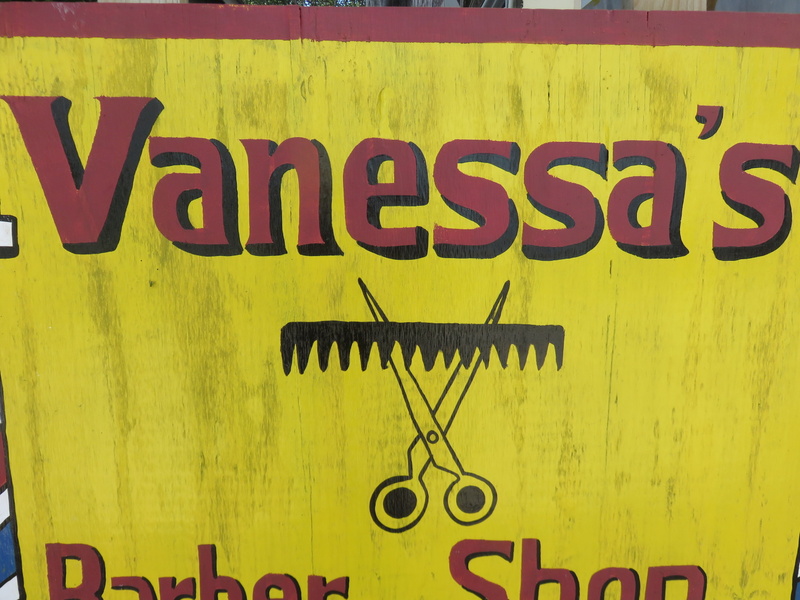 Fun post, but is there anywhere on the island for a lady to get a cut? I usually keep mine short but started growing it out last year when the hubs & I started to get serious our move to the island in the next couple of years. I figured long hair would be easier to maintain, but I am a short hair gal to the core. 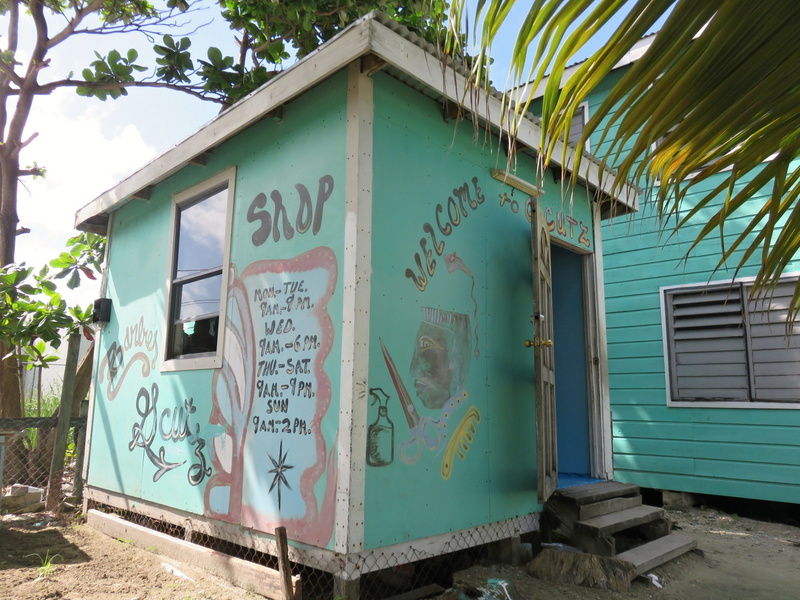 Carol Goudreau has a nice shop for the ladies……. It’s C. G. Esthetic on Coconut Drive. middle st…..center of town….how convenient ! i’ve known of karim’s mom’s salon, for decades..she’s as sweet as it gets…!!! Thanks everyone. I think the growing out process stops now! 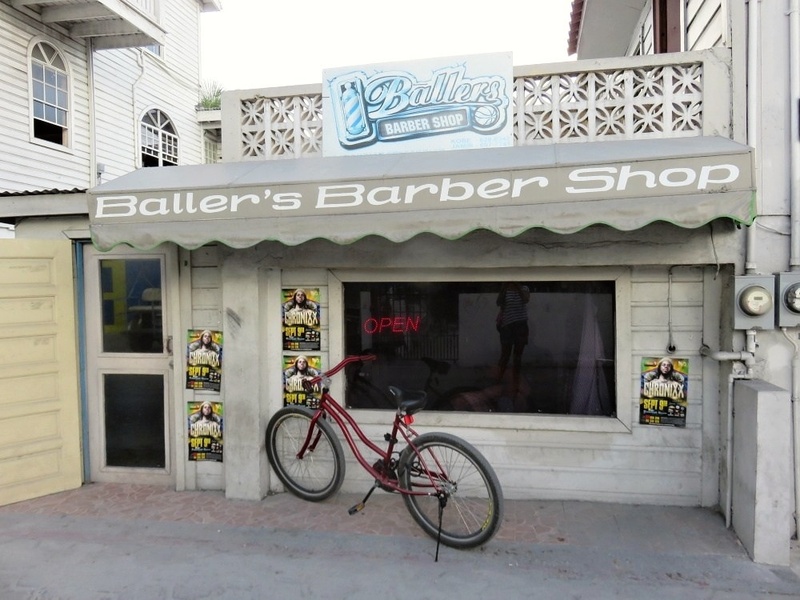 for me, it’s the ballers……..
its been the ballers for me….since Jerome first opened. i am a loyal client, as are many others. it’s all about the people . 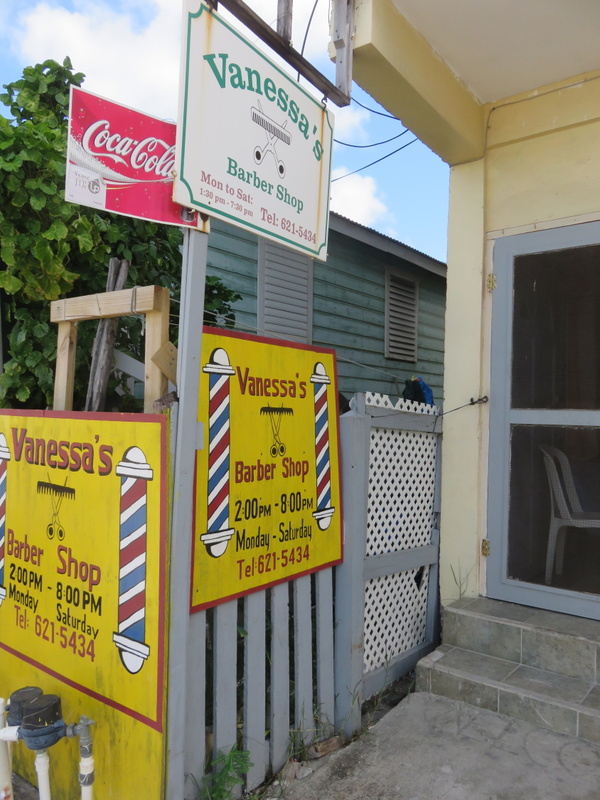 what do retired b-ballers do…these ones….they cut hair…. really well.!!! 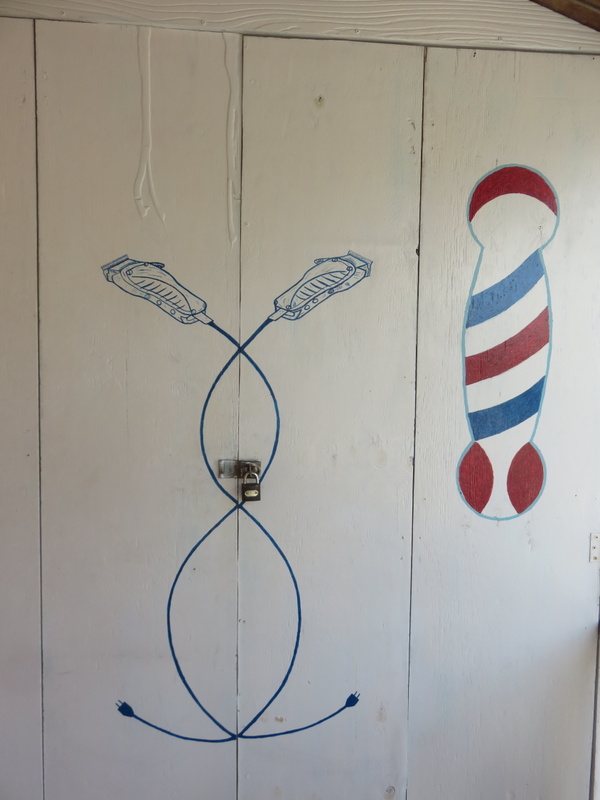 Ballers are a definitely favorite…those guys are GREAT with the clippers. And popular! Another interesting point is that some of these shops are open at odd hours compared to the USA. Not unusual to see them open and cutting hair at 9 pm or later. It is interesting…I guess cuz many waiters, bartenders get off later and need a clean-up. Often! I can’t believe I had such a hard time finding a shop a year ago, but although there are this many they are not always obvious or in plain site. h/t Rebecca for making this list, I’m sure it will be helpful to many new comers. 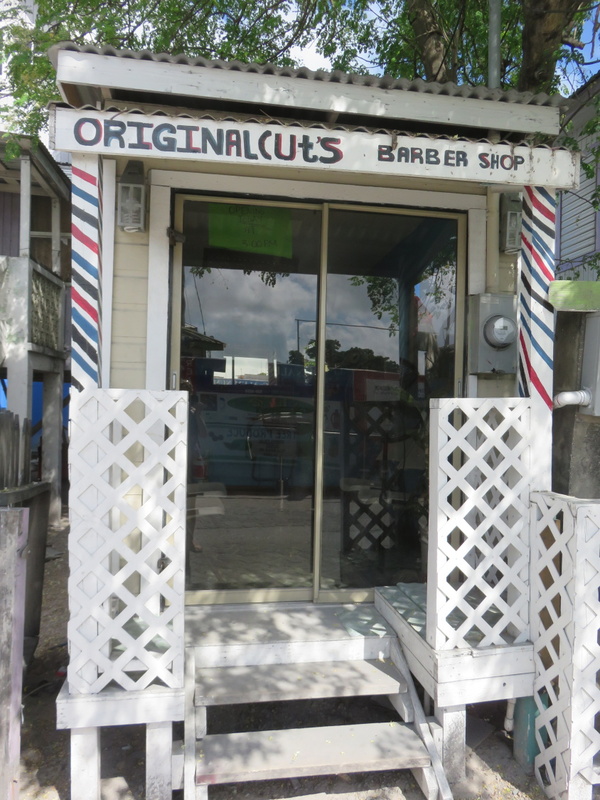 I found Island Barber Shop and have always enjoyed our conversations while I get a #1 all over scalping for BZ$10.00, so as always when I find someone or something in San Pedro that I really like, I looked no further. 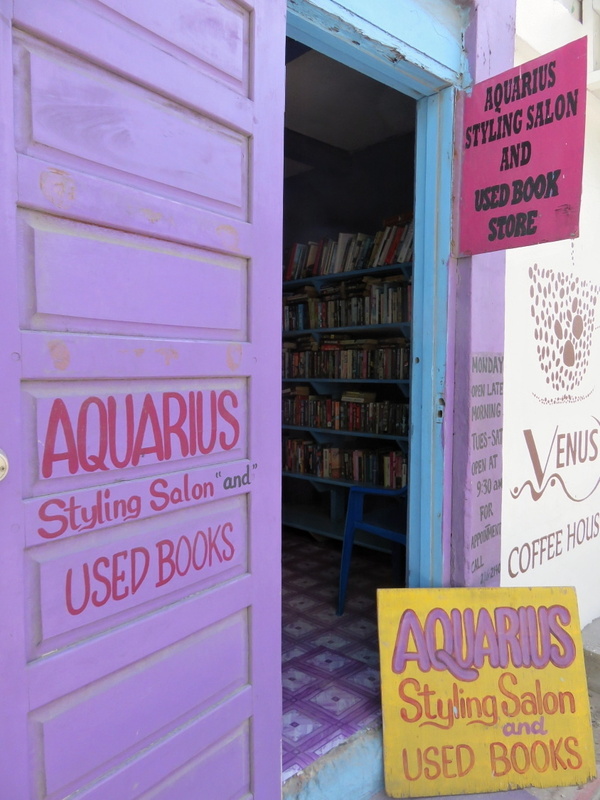 Lorilee found Aquarius just a few blocks from Island as an answer to not only her hair requirements but also as a place to trade her read books for unread books. I would say Kim must be the best in the world, she is the first person to cut Lorilees hair (in the twenty some years that I have known her) and Lorilee is not only “not stressed” when she leaves, but actually very happy. So…….. For obvious reasons, I appreciate Kim at Aquarius Styling Salon as Well.